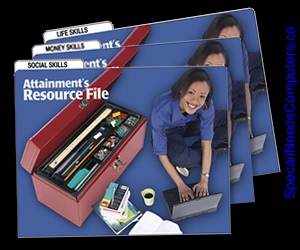 Four convenient resource files cover hard-to-teach content areas: Money, Life and Social Skills. Each file folder includes dozens of reproducible student activity pages plus a PDF on CD for easy printouts. Taken from 10 of our best curricula. 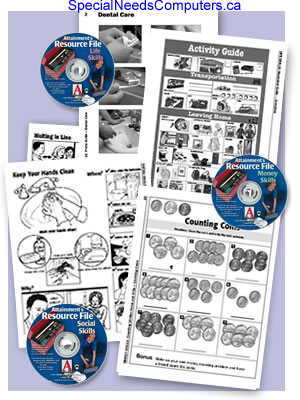 Money Skills Resource File features 56 illustrated money worksheets that progress from money identification to making change, banking and budgeting forms to shopping worksheets for calculating discounts and sales tax. Includes a PDF on Win/Mac CD. Life Skills Resource File contains 74 pages of illustrated guides for shopping, menu and clothing choices, daily activities plus photo concept discussion pages on personal care, housekeeping and community topics. Includes a PDF on a Win/Mac CD. Social Skills Resource File includes 105 picture pages illustrating personal, school and community social skills. Includes a PDF on a Win/Mac CD. Each Resource File is available individually or in this money saving package.